Since 1922 the Hellenic Ladies Benevolent Society (HLBS) offers its philanthropic services to low-income families of our community, bringing them financial assistance and a ray of hope. 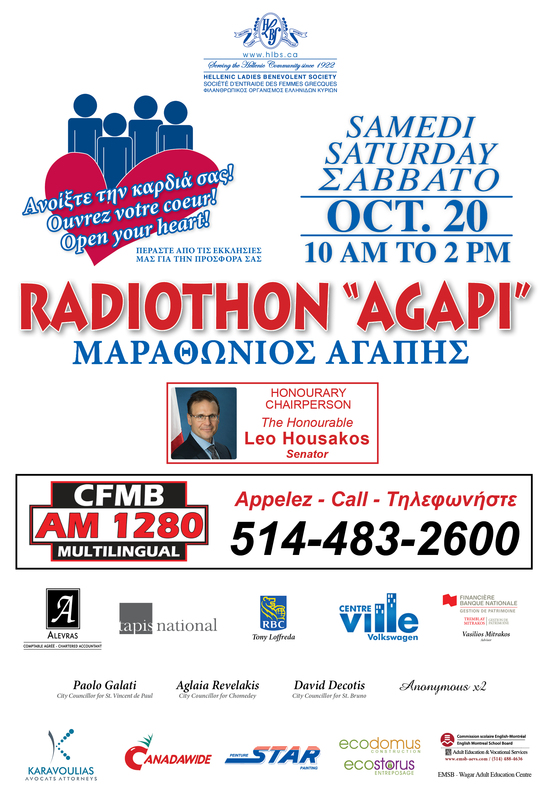 For 49 years you have shown your philanthropia through your donation to the HLBS Radiothon “Marathon Agapi”, in support of the HLBS Welfare Program. Our annual radiothon is important for everyone in our community, so by working together we can make a difference. Your support will give HLBS the means to help improve the lives of others for this upcoming year. We are counting on your compassion and generosity. You can mail your donation in the enclosed envelope or call in your donation at 514-483-2600 on Saturday, October 20th, 2018. All donations will be announced on CFMB radio. Official tax receipts will be issued for all donations over $20. 00. We count on your support and thank you in advance!